Vinay Bhat (born June 4, 1984) is an American chess Grandmaster. Bhat earned his third Grandmaster norm in July 2007 at the age of 23, though he did not obtain the Grandmaster title immediately due to rating requirements. Bhat earned the Grandmaster title in October 2008. As of the 2010 US Chess Championship in Saint Louis, Bhat was ranked No. 16 in the US. Bhat first learned to play chess at the age of 6. His mother taught him and his older brother, Harish (now a professor at UC Merced system) how to play. The two brothers started playing in the Kolty Chess Club in Campbell every Thursday night. Bhat spent his early years studying the games of Paul Morphy and José Raúl Capablanca as a part of the Blue Knights. "That was my steady diet," Bhat said. Bhat studied chess with GM Gregory Kaidanov. At 10 years and 176 days old, Bhat became the youngest national master, breaking the record previously held by Jordy Mont-Reynaud (10 years and 294 days), Stuart Rachels (11 years and 10 months), and before that by Bobby Fischer (age 13). Since then, his record has been broken three times, by California players Hikaru Nakamura, Nicholas Nip, and Samuel Sevian. In 1998, Bhat contributed to "Whiz Kids Teach Chess" (ISBN 1-58042-007-9) with Eric Schiller. At the age of 15 years and 10 months, Bhat became an International Master, at the time the youngest ever in U.S. history; this record was later surpassed by Hikaru Nakamura and is presently held by Ray Robson. After taking an extended break from chess, Bhat began to play regularly again in 2008. 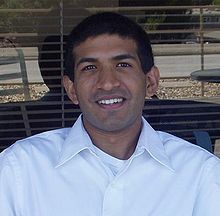 On April 22, 2008, it was announced that Vinay was awarded the 2008 Samford Fellowship. This fellowship was created to "identify and assist the best American chessmasters under the age of twenty-five by providing top-level coaching, strong competition and access to study materials." Bhat was awarded with the title of International Grandmaster in October 2008 when he crossed 2500 FIDE, with his three Grandmaster norms coming from Qingdao (China, 2002), Balaguer (Spain, 2006), and Balaguer (Spain, 2007). As of the 2011 United States Chess League (USCL) season, Bhat has the fifth highest performance rating in the history of the league (minimum 20 games) and is fifth in the all-time MVP rankings. Bhat graduated from Lynbrook High School in San Jose, CA, in 2002. While at Lynbrook, he played on his school's chess team, leading it to victory in local state and high-school competitions. Instead of focusing solely on chess, Bhat chose to continue his education and received a B.S. in Statistics and Political Economy from the University of California, Berkeley in 2006. In 2004, while an undergraduate, Bhat co-founded the East Bay Chess Club. Until receiving the Samford Fellowship, Bhat was employed at Cornerstone Research, an economic consulting firm headquartered in Menlo Park, CA. Bhat currently in San Francisco in Silicon Valley. Bhat plays poker casually and has won a local tournament. He listens to hip-hop and Indian music and cites J-Live, Gift of Gab, Wu-Tang Clan, and Nas as among his favorite artists. Bhat has expressed that he found GZA's 2005 album Grandmasters particularly interesting for its references to chess. In his recreational time, Bhat enjoys playing tennis.